Remnant prairie plants are blooming again on the Andersons’ family farm after they began grazing their cattle rotationally, removed cedar trees, and reintroduced fire into their pasture. Nathan and Sarah Anderson explore their pasture with Luke Gran on a Land Walk in early 2016. 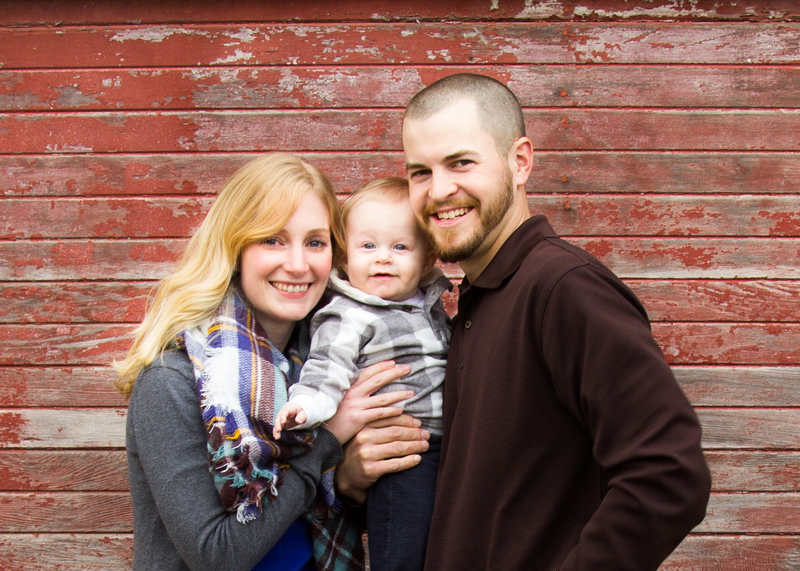 When Nathan and Sarah Anderson decided to switch to a rotational grazing system, it was mainly a financial decision. 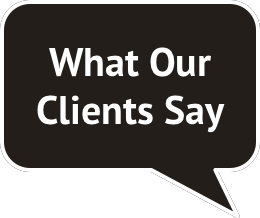 “We wanted to improve returns to our cow herd and our land base,” said Nathan. They did not know it then, but changing grazing practices would have a dramatic impact on far more than their bottom line—it would expand the territory of native plants that had not bloomed in decades. Nathan first learned about raising cattle while growing up on a farm near Cherokee, Iowa, where his family has a cow-calf operation in addition to raising corn and soybeans. After studying at Iowa State University, he and his wife Sarah returned to the farm in 2010. They were equipped with the latest agronomic training, and a vision to transform the cattle enterprise with rotational grazing. 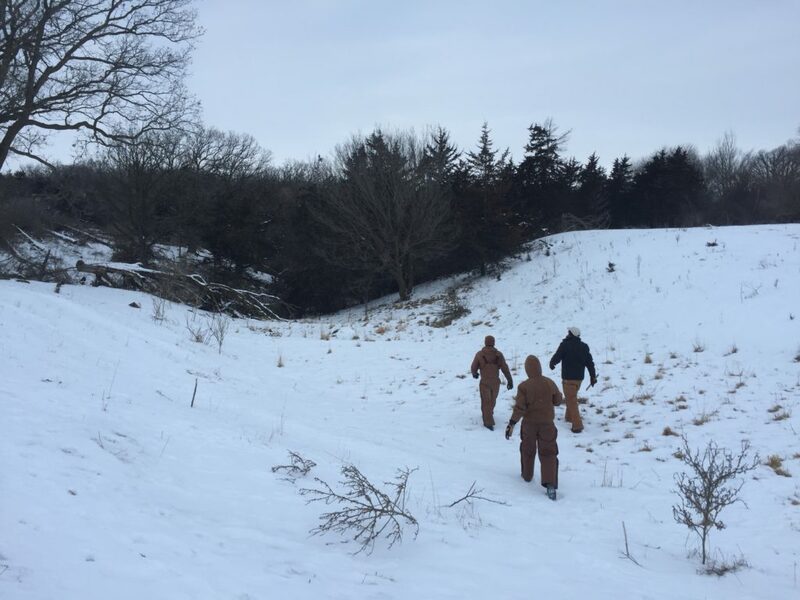 In November of 2016 and December of 2017, Prudenterra’s crew helped the Anderson family remove cedar trees from their pasture. 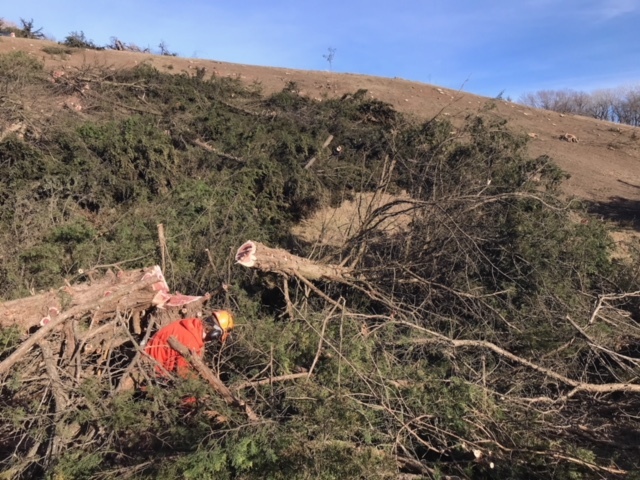 To aid in their efforts, the Andersons received some funding through EQIP (The Environmental Quality Incentives Program) for cedar removal and rotational grazing. They dedicated weeks to cutting down cedars with chainsaws while Sarah was on summer break from teaching middle school, or when Nathan and his dad Randy were done with the harvest. Then, six to eight months later, they would conduct a prescribed fire to burn away the debris of felled trees, increase the growth of pasture forage, and kill young cedars. Though the soil is bare after cutting, it will soon be densely covered with pasture and remnant prairie plants. The following January, they set out with Luke on a Land Walk to explore their snow-covered ground. While trekking through an especially cedar-rich corner of the pasture, Luke recognized the large lateral oak branches that are characteristic of a savanna remnant. Nathan and Sarah were moved to prioritize removing cedars from this area, because of the high potential habitat value of the oaks. Luke encouraged them to continue to conduct prescribed burns, and have a botanist take an inventory of the native prairie species during the growing season. Monarch butterflies gather nectar from flowering buckwheat in Nathan and Sarah’s field of mixed warm-season cover crops adjacent to the remnant prairie pasture. Additionally, he mentioned that they might find financial support for restoration by applying for grants offered by conservation organizations. A year later, the Iowa Natural Heritage Foundation (INHF) announced a Monarch Initiative grant opportunity in the Little Sioux River Watershed. 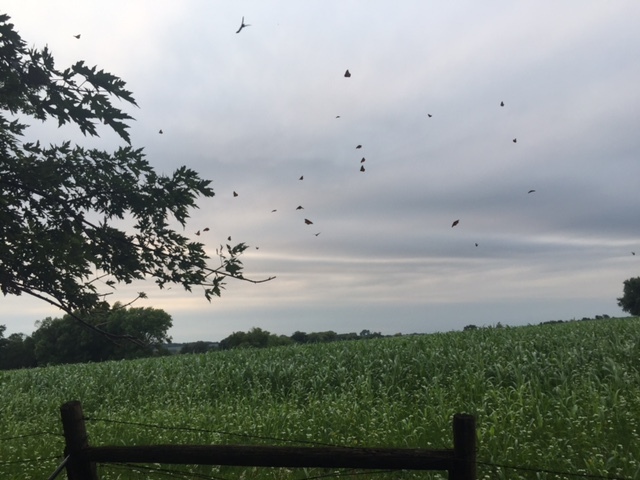 Luke thought immediately of the Andersons, not only because it matched their farm’s location and goals for biodiversity, but also for their history of hosting migrating monarchs. In the late summer and fall, Nathan and Sarah’s farm had at times been visited by a kaleidoscope (a large group) of monarch butterflies. They had fed on nectar from flowering cover crops like buckwheat that were growing in the field adjacent to the pasture. Remnant prairie offered the prospect of a larger and more diverse food source for monarchs, and Sarah and Nate hoped this grant could help accelerate its restoration. However, they first needed a native plant identification expert to take a look at their pasture to verify its remnant status and determine the odds of restoration success. 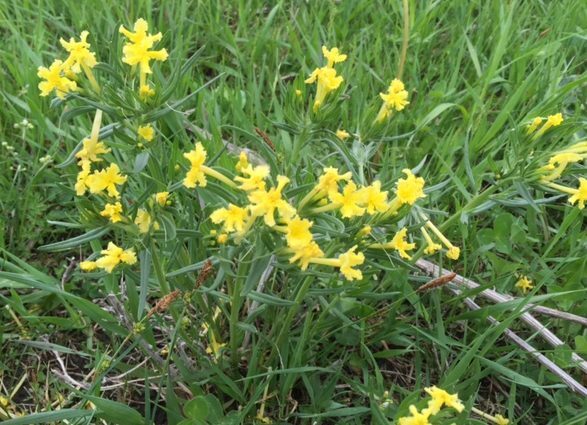 Fringed Puccoon (Lithospermum incisum), a native prairie species, blooms in the pasture at Bobolink Prairie Farms. 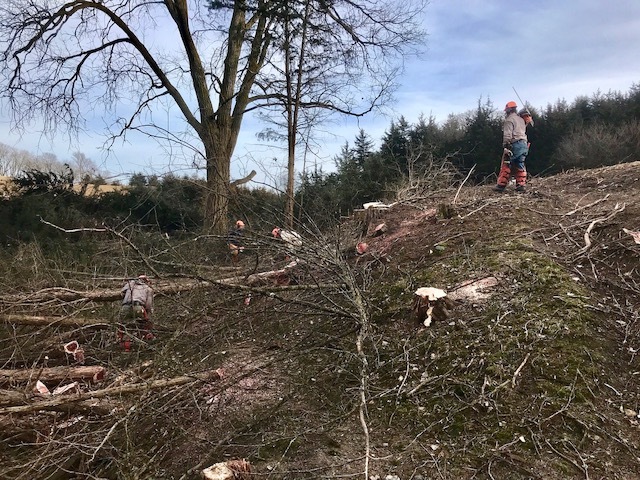 They applied for and received the Monarch Initiative grant, and put the funds to work in December of 2017 when Prudenterra’s crew of sawyers cleared three and a half acres of cedar trees. This portion of reclamation was only recently completed, but with a project that spans back seven years and covers seventeen acres, it is already possible to see the remarkable impact it is having on the ecology of their farm. 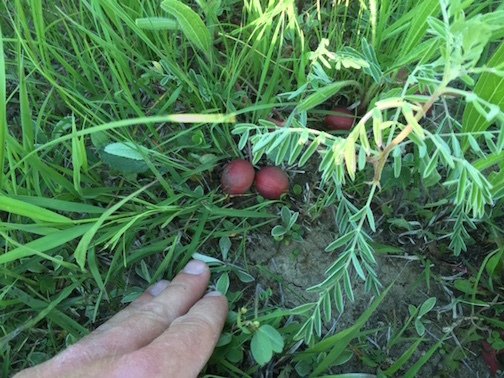 Ground Plum (Astragalus crassicarpus), one of the native prairie plants found in the Anderson family’s pasture. The near-disappearance of Iowa’s prairie has contributed to to the decline of many species of wildlife–not only pollinators such as monarch butterflies, but also grassland birds such as the bobolink. When Sarah and Nathan started their farm back in 2010, they named it Bobolink Prairie Farms for a grassland bird that they hoped to bring back with their regenerative rotational grazing practices. They could not have known it then, but the reach of their native species restoration would extend far beyond what they had envisioned. Their farm’s ecological heritage was there all along–beneath the branches of the cedars.